Photo programs abound for working with the image files from your Nikon D7100, ranging from inexpensive solutions for beginners to high-end professional options. The good news is that if you don’t need serious photo-editing capabilities, you may find a free program that serves your needs. Nikon ViewNX 2: This program, found on the CD included in your camera box, provides a photo organizer plus a few photo-editing features. You also can use the program to download pictures and to convert Raw files to a standard format. The figure offers a look at the ViewNX 2 window as it appears when you use Thumbnail Grid view mode, one of three display options available from the View menu. One cool feature to note: You can view picture metadata, which is hidden data that records the settings you used to take the picture. Just display the Metadata panel, located on the right side of the program window. If the panel is hidden, choose Window→Edit or click the triangle on the far right side of the window and then click the triangle at the top of the panel. Many other photo programs also display metadata but sometimes can’t reveal data that’s very camera-specific. This book features Nikon ViewNX2 version 2.7.4. To find out which version you have, choose Help→About ViewNX 2 in Windows or ViewNX 2→About View NX2 on a Mac. If you own an earlier version, download the updated software from the Nikon website. Otherwise, the software may not be fully compatible with files from your D7100. Apple iPhoto: Built into the Mac operating system (OS), this program offers a download tool and organizer plus some basic editing features. Apple provides some great tutorials on using iPhoto at its website to help you get started using the program. Windows Photo Gallery: Some versions of Microsoft Windows also offer a free photo downloader and browser, Windows Live Photo Gallery. (The name varies slightly depending on your version of the Windows OS.) Like the other freebies mentioned here, this program offers a few basic retouching tools — again, depending on which version of Windows you use. With a full complement of retouching tools, onscreen guidance for beginners, and templates for creating photo projects such as scrapbooks, Elements offers all the features that most consumers need. 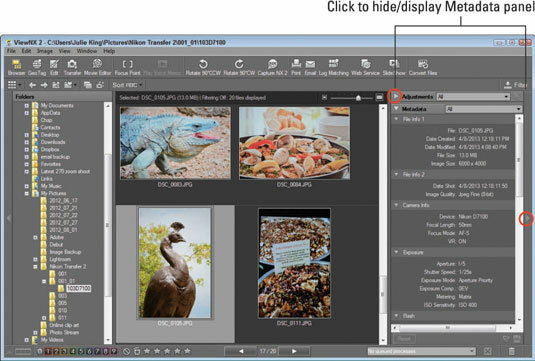 This Nikon program offers an image browser/organizer plus a wealth of pro-level photo-editing tools, including a sophisticated tool for processing Raw images. Visit its website for tutorials. Aperture is geared to shooters who need to organize and process lots of images but typically do only light retouching work — wedding photographers and school portrait photographers, for example. Lightroom is the Adobe counterpart to Aperture. In its latest version, it offers some fairly powerful retouching tools as well. Geared to photo pros, Photoshop offers the industry’s most sophisticated retouching tools. Of these programs, only Elements is designed with the novice in mind, and even using Elements involves a bit of a learning curve. Buy (and read!) a guidebook or take some classes to help you maximize your software investment. Not sure which tool you need, if any? You can download 30-day free trials of all these programs from the manufacturers’ websites. One caveat: If you’re interested in converting Raw files using the program, make sure that the software supports your D7100. If you own an older version of the program, you may need to update to the latest version in order to work with your camera’s Raw files.